Following on the successful footsteps of GPS Trainer, ASA is proud to announce an addition to the interactive computer-based tutorial product line: Communications Trainer: Say, Again Please. Pilots use their computer for the interactive tutorial, and use their home, car, or computer stereo to listen to the audio review. 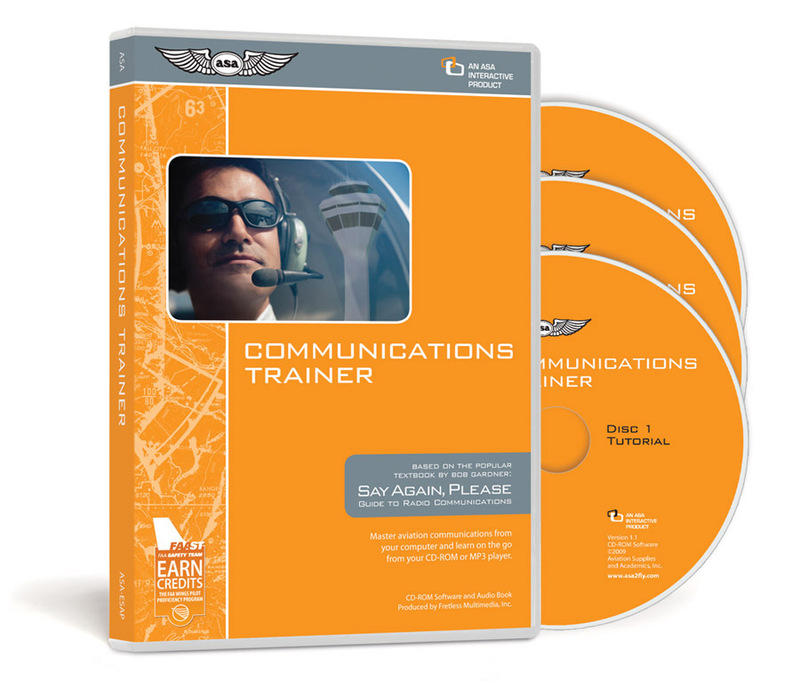 Computer learning tools in the form of audio clips, animations, original figures and diagrams combine with the text of Bob Gardner's popular Say Again Please book, to teach radio communications in VFR and IFR operations and all airspace classes. Pilots will increase their comfort level when using an aircraft radio with examples of typical transmissions that explain how the air traffic control system works, presenting simulated flights that clearly demonstrate correct communication procedures. 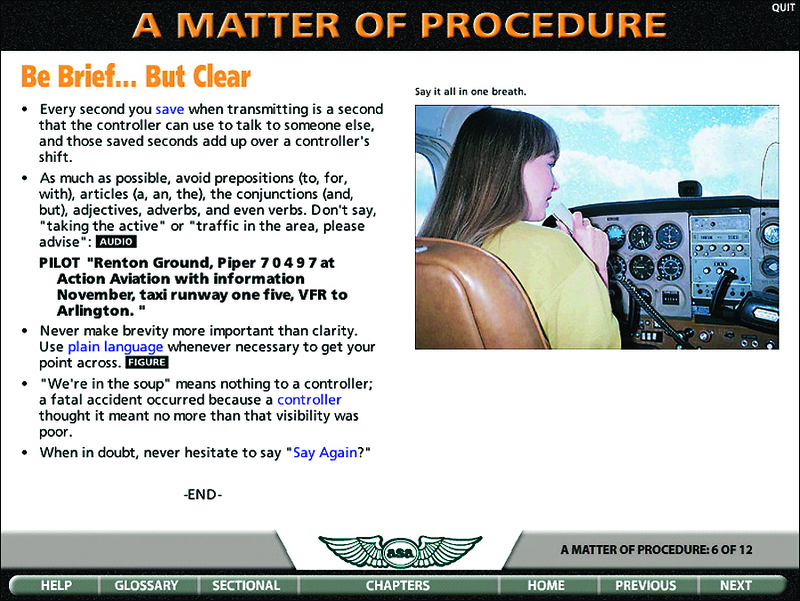 Communications Trainer: Say, Again Please is an invaluable tool for students who want to practice before their flights, those with rusty communication skills, those who rarely fly into heavy airspace, those who want to practice copying and comprehending clearances, and those who want to sound like a pro - both VFR and IFR. It is especially helpful for English-as-a-Second-Language (ESL) students. Applicable to VFR and IFR operations, towered and nontowered airports, enroute flight, and emergency situations. Intuitive software is as easy to use as reading a book. Typical transmissions are supported with textual descriptions, sectional and airport diagrams, and audio clips for all airspace classes so pilots not only learn to speak aviation, but also gain a fundamental understanding of what needs to be spoken when, where, and to whom. Turn-key details take pilots from a preflight briefing and filing a flight plan to ground, to enroute, and terminal operations, including in-flight weather requests and pilot reports. Interactive exercises integrate with the tutorial for practice of each scenario. Understand how ATC works and learn what to say, what to expect to hear, and how to interpret clearances and instructions. Extensive reference library include FAA documents, websites to live ATC, and glossary. 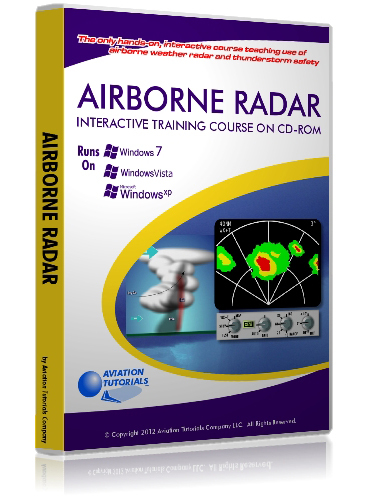 Listen in your car, home, or computer CD player as the narrator takes you through a comprehensive Audio Review consisting of standard dialogs with a full cast of characters: pilots, ATIS, Ground, Clearance Delivery, Tower, Approach, Departure, Center, AFSS, and UNICOM controllers in all airspace classes, VFR and IFR operations, and emergency situations. Discover more about our flight training materials here!